Scented polish. This is probably one of those things I should stay away from. It always sounds so intriguing, but it's probably not the ideal product for someone who is sensitive to smells. This Revlon is a nice color, but blech I can do without the smell! Ocean Breeze is a shimmery/frosty teal with blue flash. Sorry it gave you a headache! Did the smell go away after a topcoat? The color is ok, but the smell would be a deal-breaker for me. Have you tried any of their other scented polishes? Great color! I never tried these because I was worried about the smell. On another note, this shade is absolutely gorgeous! I love it! colourcoated- I've tried some of the others, and some are tolerable, but not this one! Mrs. Lacquer- Yes! It still smells after topcoat! Megan- I've tried the Blueberry one..it's nasty too. I have a cherry and a grape on they're tolerable. 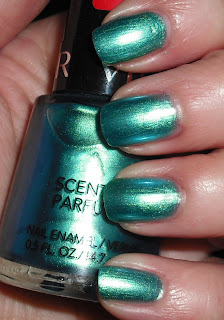 BeautyByBrittany- Yeah, Revlon has a Top Speed called "Ocean" that I think is the same color as this without the stink! applepark- Ugh, Blueberry was terrible too! Joan- That's cool! Yeah, I'm sure some scents are terrible. I have a feeling chocolate wouldn't be too bad. I feel the same way about the smell. It smells like a Calgon spray I used in jr. high too! I out a clear polish top coat over it and it covered the smell, yay! I do love the color though. Valentines Day: Pink, Hearts, & Crackle! Sally Hansen The Real Teal & Happy Birthday Mom!